I guess he’s become somewhat controversial because his students now do all the work, and the art snobs think he’s become too commercialized. But every time I’ve seen his installations, they have fit the surroundings so well. Having no crowds was so special – especially not to hear the incessant chattering. Quite spiritual for two hours. Snooty-eths and know-it-all-eths can be annoyingeth. I’m not much of a picture taker, but how wonderful it must be to stroll those lovely gardens so early and without a crowd. Your photos are beautiful! Beautiful photos! 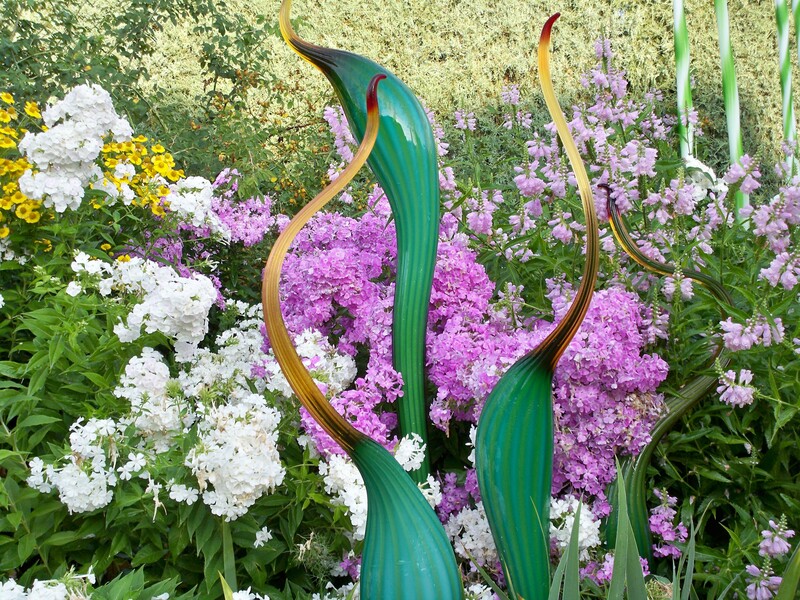 Those sculptures are amazing! I had to go look up what they were made of and found they were glass. Thanks for sharing! Aren’t they imaginative?!? How they can use glass malleable enough to “blow” yet strong enough to withstand our earlier hailstorms is quite a feat. I’d love to be able to go there, especially the promise of the sunrise entry. It’s so frustrating trying to photograph when the crowds are out. Yes, I’m sure that is frustrating for photography artists. I enjoyed the quiet immensely. Thanks for visiting, Eileen. Those are incredible works! I’m glad you had the chance to take the photos and share them. Thanks! They do remind me of very polished “upper class” versions of some of your mineral gems! 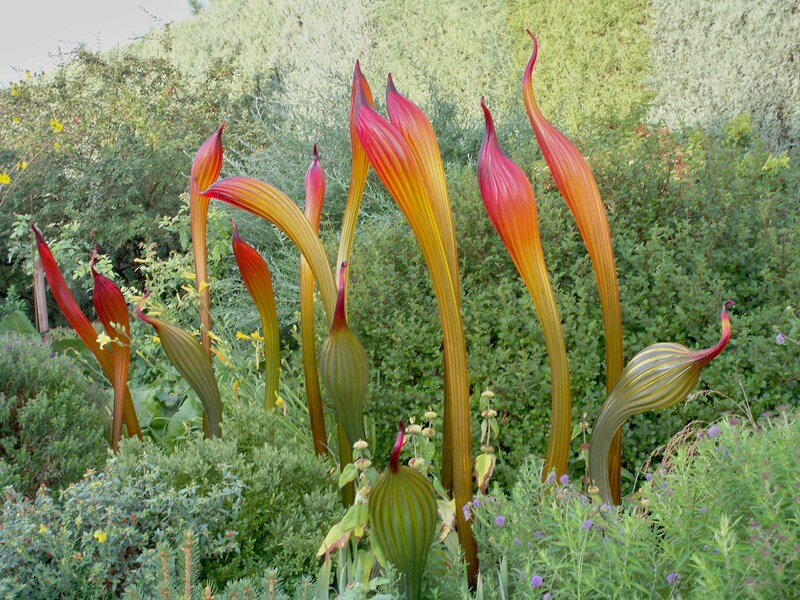 Now, not to gush or anything, but I Googled some images from this guy’s works and the exhibit in Denver… I do prefer your photos… more intimate, or something… they aren’t as splashy or outspoken… the artwork blends in to the point where I had to ask, is that glass or botanics? That praise will carry me for a long time. Those photos are absolutely breathtaking Sammy! You can certainly hold your own in the photography department. Blogging has given me new confidence in that area as well. 🙂 Thanks for sharing these stunning images. Thanks, Debbie! I probably don’t know what I’m missing with my amateurish camera and lack of lessons. On the other hand, some subjects just seem to photograph well no matter what! 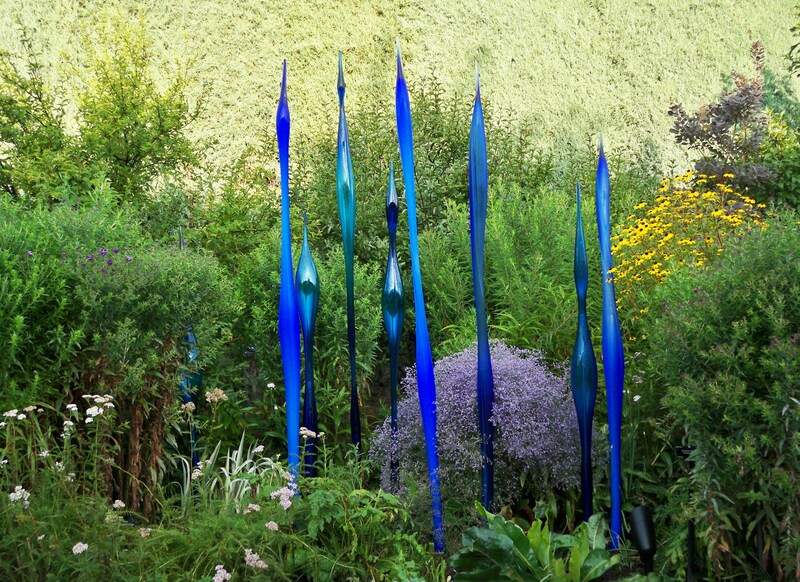 I’m glad you liked Chihuly’s pieces. I have a few more for later. So absolutely beautiful. The colors the shapes, everything here is so much more gorgeous than any statues we could make, buildings we could erect. I am particularly in love with the second to the last shot. Thanks for sharing, Sammy. Thanks for visiting, Silvia. His work had such vibrant color and shimmer; i felt like I was visiting a zoo with some of these pieces! You betcha 🙂 lord knows I’ve drooled on your images !! Thank you! It’s a traveling exhibit; perhaps one day near you? It’s one of the things. I like best about our blogging community – having access to what others share. Blogging is such a great resource, I agree! I’m on the other side of the pond so I think probably your post is the closest I get to these amazing specimens! Hearty thanks for sharing. 🙂 and not a pond we can row the boat across! Your photos are great, even without an upgraded camera. What a wonderful idea, to allow people interested in photography to have some exclusive time. I loved the lack of crowds; will look for such opportunities in other venues. Fortunately this wasn’t an “if you can afford it, you can come”, which is all the more amazing that it was offered. Thank you, Kirsten 🙂 All credit really goes to those volunteer gardeners who lovingly tend the residents of that lovely garden. Lovely. Thank you for the unexpected inspiration. 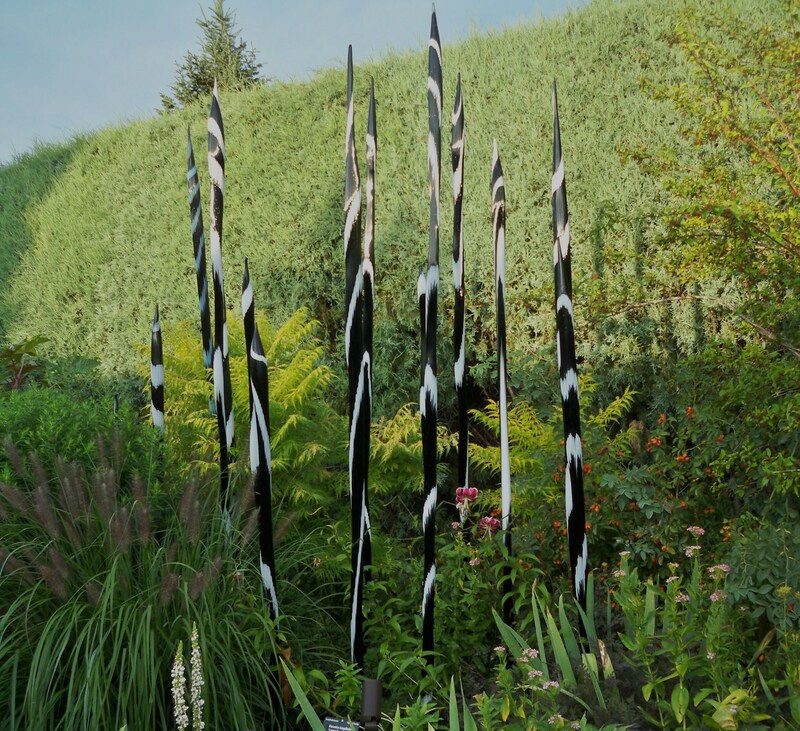 Are these Murano glass? They remind me of it. 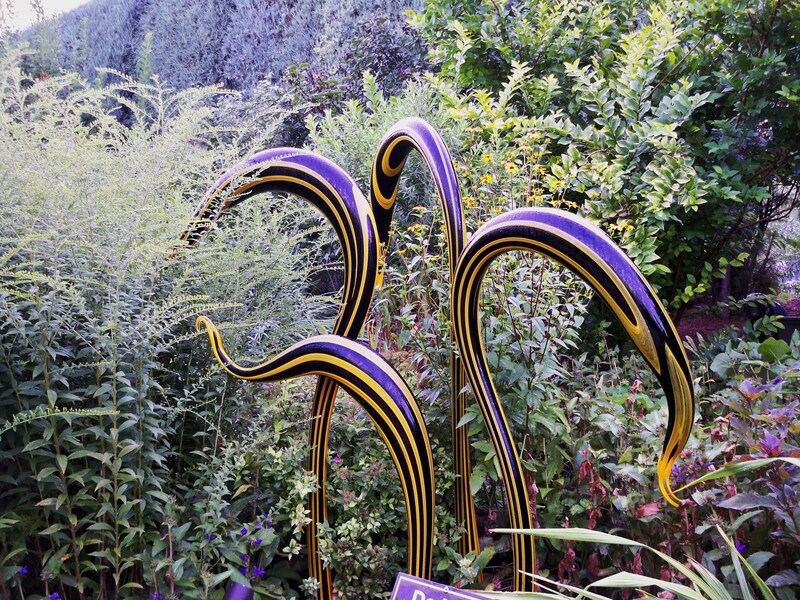 Elizabeth – they do resemble Murano glass, however this is an American glass artist named Dale Chihuly. He is based in Seattle where he has opened a school, and he’s old enough now that most of the work is done by apprentices under his direction. Thanks for visiting and I’m glad you enjoyed these. I’ll have a couple more posts in coming weeks. And I’m wondering how in the heck they safely package these beauties to ship them between destinations! I think I will visit the Garden at the end of the exhibit to watch. I was going to say these look more like surreal art because I thought they were real. Duh. :-). There are a couple I swear became real as I was there! O wow! So beautiful.. and you captured them so well Sammy. 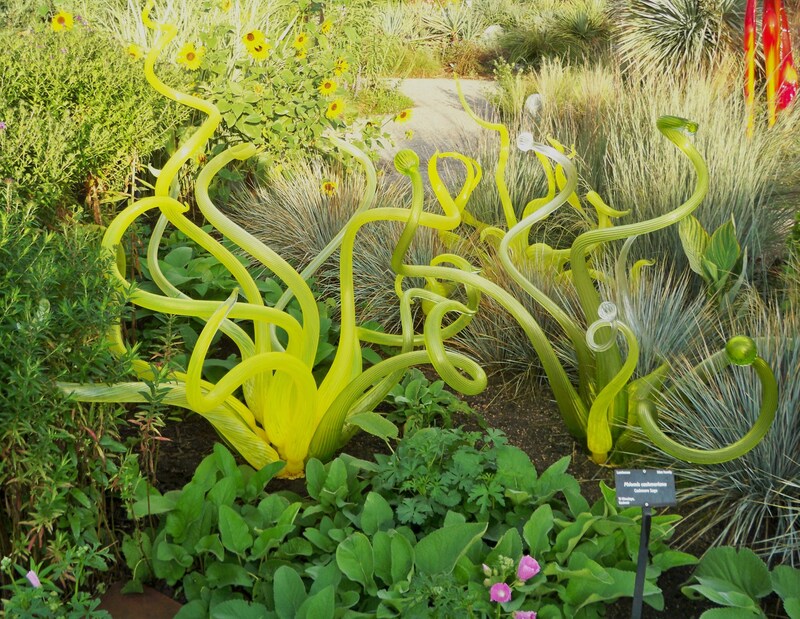 Dale Chihuly is such an artist. They blend so well within the garden. How on earth are these jewels transported. 🙂 that’s what I want to know!! They can’t possibly bundle them all up in the stealth of night, but I’m going to find out if We are allowed to watch the crating. Third, fifth and sixth are my favorites. What a great space! :-). And I haven’t even posted MY favorites yet !! Beautiful. I love his work! I nominated you for bookshelf tag, a pseudo award where you talk about books and nominate five other bloggers. Feel free to participate or not, whatever you are most comfortable with. Thank you, Elizabeth. I’ll respond on your own post. What a fun opportunity – and you got some gorgeous photos out of it! I love his art. 🙂 thanks, Laurel. I’ve been working all afternoon trying to tangle patterns from one of his pieces I haven’t yet shown in a photo. It’ll be awhile before I know whether I have something worth showing. 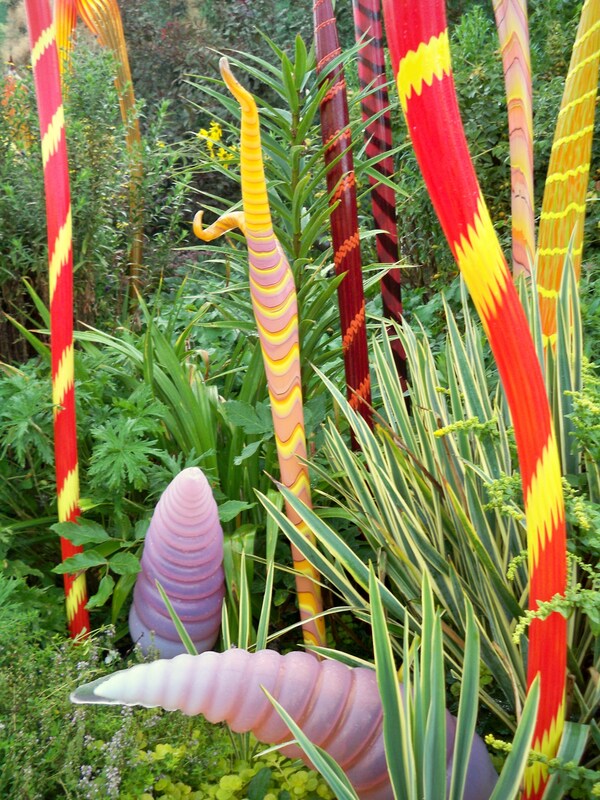 This isn’t the first time I’ve seen photos of Chihuly’s work, but they always delight. Just beautiful! Thank you, Joanne 🙂 the settings give them such context.